When a company acquires or merges with another company, one of the challenges is that the two prior independent organizations each have their own data systems for the same departmental functions such as sales, marketing, customer service, and accounting. If the merger companies competed in the same markets, then there will most likely be an overlap of customer and prospect records in these legacy systems. In building a new consolidated database, the newly formed organization does not want to create duplicate records; however, they also do not want to lose valuable information. • Multiple records exist for the same prospect or customer organization due to multiple contacts, multiple locations, or data entry errors. • SingleVision identifies all the records related to the same organization in all available files and assigns a common ID number to them. 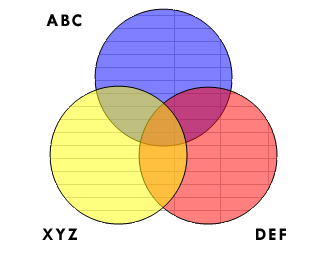 • There is redundant information from common departments within each company. 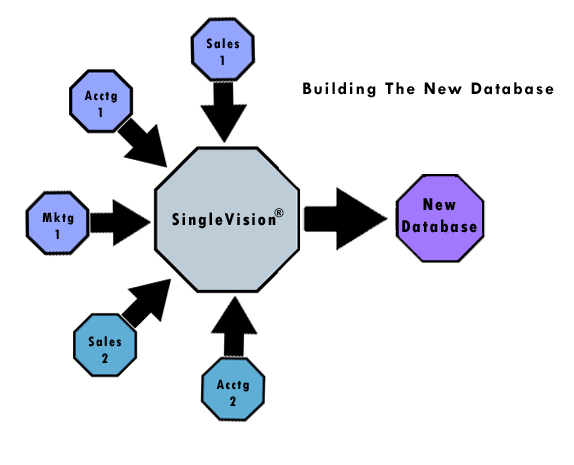 • SingleVision eliminates duplicate records before populating the new database. • Errors and outdated information already present within each system’s database. • SingleVision prevents erroneous and unnecessary records from being transferred to the new database. Prior to building the new databases, SingleVision can also help clean up the data issues in legacy systems that were created independently of the merger of the organizations. These data issues can be caused by multiple manual entries into different systems about the same organization, or purchasing external files that contain data about the records already in the internal systems. Data from disparate files are matched and linked using the robust Cluster Match & Link resource built in to SingleVision. Matched data records can be viewed and managed in SingleVision’s Resolver Viewer. 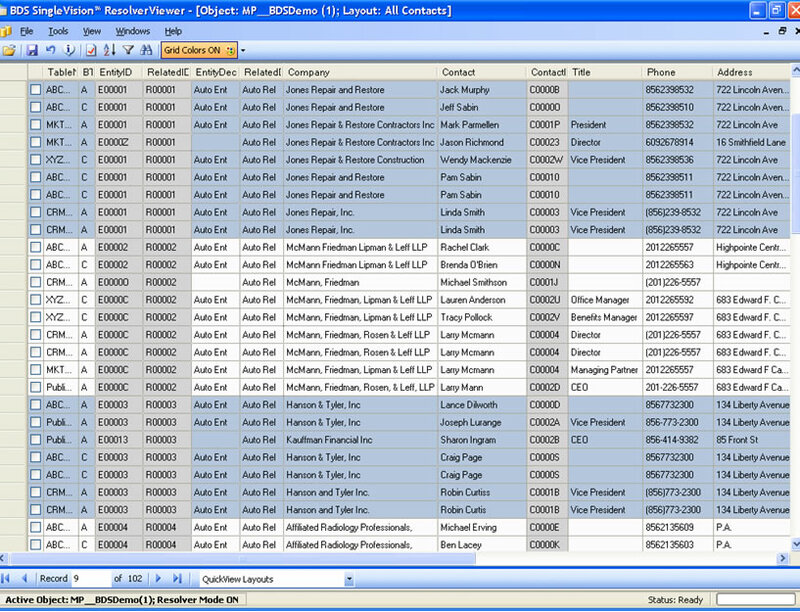 Click here to view a screenshot of the ResolverViewer. SingleVision also gives managers an immediate “Quick View” that lets them understand and act on data sooner, without having to wait months for a detailed analysis of your M&A results. Areas of data overlap are identified, making it easier to assess the value of the unduplicated data coming from each legacy database.